I smell a contest or a phone launch of some sort. 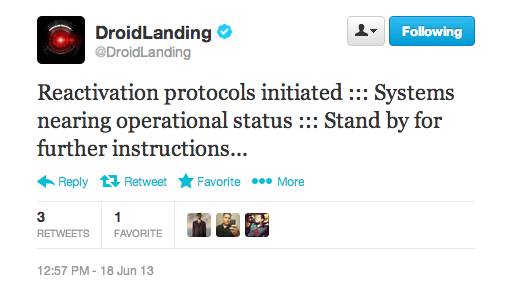 We haven’t had a DROID phone from Verizon since the DROID DNA launched last year – what could this be? Something from Motorola? Something from HTC? You tell us. 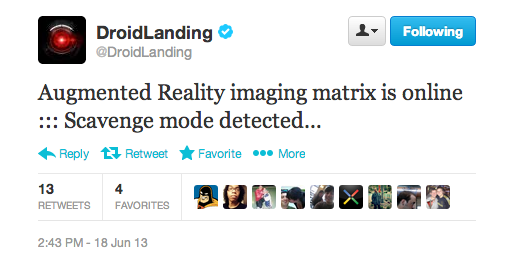 Update: Another Tweet has gone out, mentioning augmented reality in the process. We have seen scavenger hunts in the past through this account, also that used augmented reality as a way to discover hidden devices that are a part of their contests. Something is coming, it’s definitely going to be DROID branded, and will likely involve a scavenger hunt in order to win one. Stay tuned!